Yes! Our annual Collective x Slow Clay is about to begin! This time we have extended it for an extra day to make 5 days of exceptional Christmas shopping. 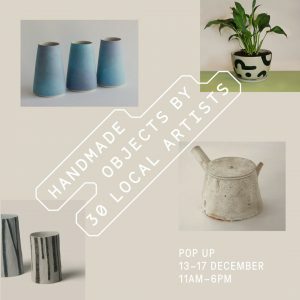 This is a curated event by us showing over 30 of our amazing colleagues where you can be sure to find some incredible gifts. This year we are focusing on the idea of COLLECTING because all our artists would form the basis of a great ceramics collection for your family and friends – or maybe for you? From established artists such as Andrew Halford, Prue Venables, Susan Robey, Jane Sawyer and Greg Daly to newcomers destined for greatness such as Grace Brown and Madeleine Thornton-Smith, we have put together a great offering to take the pain away for you! Please come and visit us and have a glass of Mount Prior bubbles on us! Daily workshops are also being offered with Hearth Collective, Cut Throat Knives, Grace Brown and Hello Blooms! Bookings essential here. Wednesday 13- Sunday 17 December, 11 – 6 daily.